My husband Lulu just bought the new Breville convection toaster oven. The first thing that came out of his mouth when we opened the box was, "We have to inaugurate the oven by using that pizza setting." The next day, I bought ready-made garlic and herb pizza dough and got very excited about trying our new machine. It didn't take much time for me to come up with a pizza topping selection. 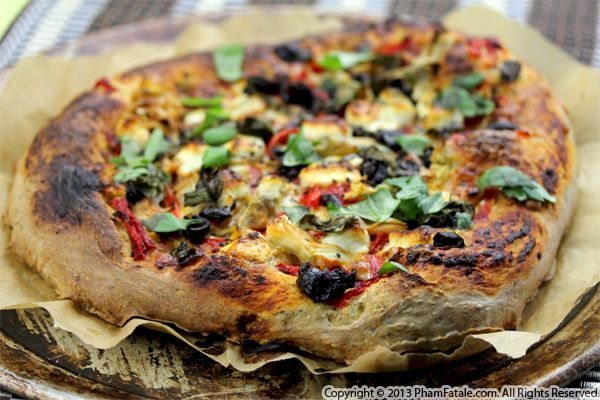 It came naturally to make it fairly healthy: a few tablespoons of tomato sauce, a bit of aged Cheddar cheese, baby artichoke hearts, oil-cured black olives, roasted bell peppers and fresh sweet basil. I could have added pine nuts at the end but I wanted to avoid any nut allergies (one family member has them). Needless to say, the oven and pizza were a hit. It took 30 minutes to prepare and bake last night's meal: mission accomplished!